Hmmm…whatever could Stephanie be thinking? Will Edison go along with it? Will Edison come up with something even more outrageous? What will Larry say? All I can say is: I think when you read Friday’s strip you’ll be glad you did. Here’s the strip where Edison tells what she remembers about getting her naval thingie. 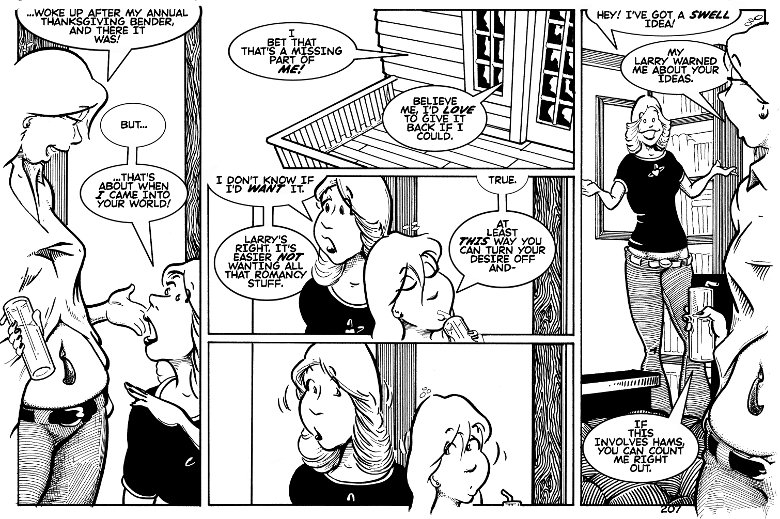 And here’s the strip where we find out about Stephanie’s ideas. Between impulsive Stephanie and drunk Edison, why didn’t the whole “touch it and see what happens” not happen? Well, Edison’s just buzzed, which, for her, counts as sober. And Stephanie knows what’d happen…which leads to her idea. Which you’ll see soon. Plus, I had thought about doing the whole “touch it and see what happens,” but that would’ve pushed the strip into NSFW space. Oh ham… At least the ideas don’t involve ham AND pudding. It must be nice though, to have that ability to turn your desire on and off. I wonder what her idea will be. Their mouths all look like hams. You’d figure they’d be more sympathetic.